All 34 of the bathing waters in the North East have been classed as either ‘excellent’ or ‘good’, passing high standards for water quality. Environment Agency officer taking bathing water samples at Long Sands, Tynemouth. The school holidays are well underway – even if summer isn’t – so grab your bucket and spade and visit one of our brilliant bathing waters this month. There are 34 bathing waters in the North East. All are classed as either an ‘excellent’ or ‘good’, and every one of them has passed high standards for water quality. The results are based on regular water sampling by specially trained officers from the Environment Agency.
! !n Environment Agency officers visit each bathing water beach from May to September every year to see what levels of bacteria are present in the water. Officers use results to maintain and improve bathing water quality. 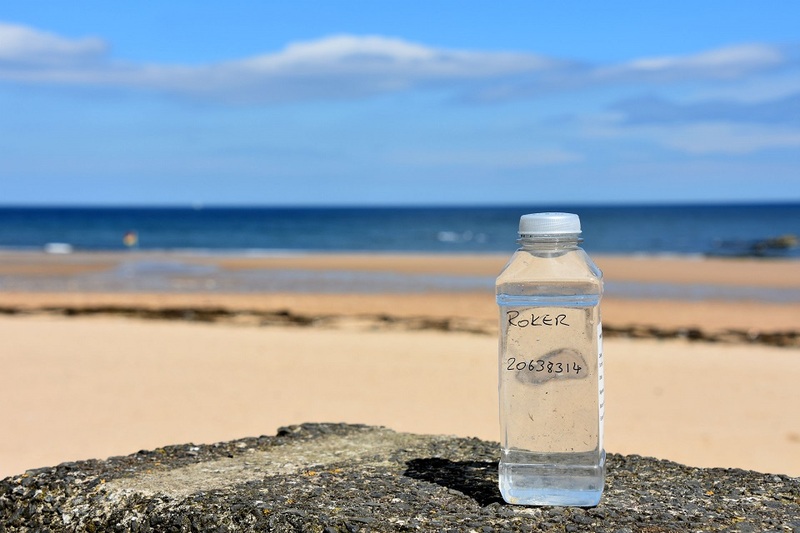 They were out taking water samples from beaches along the coastline from Blyth to Roker on Monday 14 August. Sun or no sun, the beach is a great day out for the kids during the school holidays. Our bathing waters are the cleanest they’ve ever been – not just here but across the country. Samples are taken regularly throughout the bathing water season and this enables us to check they are safe for people to enjoy. We know how much people like going to the beach and the great benefit this has on the local economy. We will continue our work to ensure these standards are upheld. A sample of bathing water taken from Roker, Sunderland. Huge strides have been made to improve water quality, helping to make our beaches even more attractive for the increasing numbers of tourists who visit from around the world. Northumbrian Water has invested £1bn over 20 years in enhancing the quality of water on the region’s coastline. Two decades of investment have seen significant improvements to the North East bathing waters and this is something we are extremely proud of. Back in 2000, only four of the region’s beaches met requirements and now all 34 meet the high standards. We know there is more work to be done, by ourselves and our partners, as great bathing water relies on constant attention to detail. To ensure our beaches are a great place to visit we continually look for new ways of working to help protect and improve our environment. The public can also do their bit to keep our beaches clean. On Monday 14 August, the Environment Agency and partners launched the #binit4beaches campaign to raise awareness of the importance of only flushing the 3P’s down the toilet: pee, poo and (toilet) paper, and always putting wet wipes in the bin. While many wet wipes claim to be ‘flushable’, they may not break down quickly once they’ve been flushed. This can add to the risk of blockages. Millions of wipes are wrongly flushed down the toilet each year which means some of them reach our much loved beaches and seas after sewers are overloaded by heavy rain or flooding. The Marine Conservation Society’s annual beach litter survey shows that the number of wet wipes found on UK beaches have echoed this trend, increasing by 700% over the last decade. The Environment Agency works 24 hours a day to protect people and wildlife from pollution incidents and we encourage people to report such incidents to our Incident Hotline on 0800 807060.